A hearty welcome to our new readers! 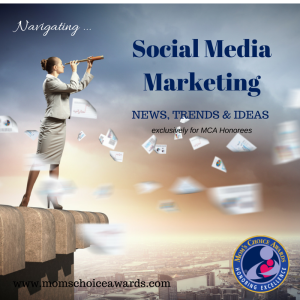 The Navigating Social Media Marketing series offers tips and how-to’s for social media marketing. Our goal: find easy-to-understand content relevant to your goals. We curate these articles from across the web exclusively for Honorees. This is a free, added benefit of being a Mom’s Choice Awards Honoree. Why? Because people who create the best in family-friendly products and services deserve a marketing edge. And we’re here to help. The full article is available to Honorees, Distinguished Alumni, and Marketing with Mom’s Choice subscribers. Learn more about the Marketing with Mom’s Choice subscription here.